Were I even to try to answer the question “Why do I love you?”, I would be denying its premise; I would be saying “I do not love you.” Why do I love you? Becauselessly. No one speaks in the silence of the world. And that is God. So Augustine allegedly said, “The church is a whore, but she’s my mother.” Big deal. Jesus said she’s his wife. For people who cannot claim a white-hot moment of conversion, or even a “heart strangely warmed”; people who are unaware, day by day, of Jesus holding their hand and talking to them in prayer; people who, in worship, sing without closing their eyes and raising their hands – is it okay for them to take Jesus as their impersonal Lord and Saviour? Have I ever had a religious experience? Not if you mean an experience of a particular kind, let alone of a particularly elevating kind. (The crack of a bat, perhaps.) Otherwise only in the gift, guilt, and grief of the ordinarie. I recently clicked on a blog post titled “Singing Contemporary Worship Songs Eschatologically” because I thought the “E” must be a typo. 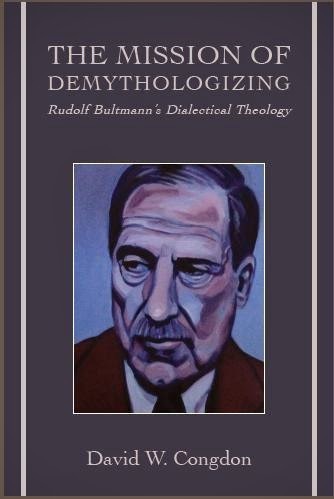 Congratulations to the quite brilliant David Congdon, whose book The Mission of Demythologizing: Rudolf Bultmann’s Dialectical Theology will be published in the spring of 2015. Reading the title off the cover, Matthew Frost tweeted, “So, is there a colon in the title, or does it just run straight through?” “Ha, colon!” David replied. So I’ve added the colon – and made it BIG. I mean, at over 700 pages, you’re going to need a huge colon to digest it, right? What is said may be either profoundly true or painfully false depending on who says it. For example, Julian of Norwich’s celebrated intuition that “All shall be well, and all shall be well, and all manner of things shall be well”: from T.S. Eliot (in “Little Gidding”) it’s a furnace-formed hope; from a spiritual dilettante it’s a cheap soporific. Students demand texts that are “relevant”. Very well, give them what they want: texts they will dismiss as irrelevant: i.e., texts that will release them from the tyranny of the contemporary and fashionable. The relevance is in the recoil. How do you prevent theology from becoming ideological? Martyrdom, perhaps, but, like the crucifixion itself, only as its witness is more an act of love than faith. His theology floats in a bowl. Prisons are full of extremely dangerous people. If they’re doing their (inside) job right, none more so than the chaplain, the “Big X” in the breakout and relocation of the humanity of the incarcerated. Why is the American prison system broken? Because it’s fixed. The traditional arguments for the existence of God are not proofs but praise, immolations of the intellect, without spot or blemish, on the altar of faith. Or – to steal a phrase from Marilynne Robinson (commenting on Jonathan Edwards) – they are reason sanctifying the unknowable. What is the difference between kindness and niceness? When children are quarrelling, we tell them to be nice to each other. Yes, because being nice is easy. It requires no effort, no empathy, no recognition of tension and difference (it comes from the Latin nescius, “ignorance”, and entered Middle English meaning “stupid”). Kindness, on the other hand, requires rigorous attention and moral imagination. It does not deny friction or fracture but acknowledges and embraces the other. The clue is in a common translation of gratia: not God’s loving-niceness but God’s loving-kindness. “The church does not have a social ethic; the church is a social ethic” (Stanley Hauerwas). That’s what worries me: epigram – or indictment? There is word-care, there is word abuse, and there is word-torture – as in the expression “enhanced interrogation techniques”. I saw that photo of LeBron James wearing the “I Can’t Breathe” T-shirt, in solidarity with the family of Eric Garner, though – unhappy coincidence – it does double-duty as an endorsement of the CIA Torture Report. “LGBT Christians Respond to Southern Baptists’ Call for Kindness, Understanding” (Religion Dispatches). Favourably, I trust. It would be quite unchristian to be mean and unsympathetic to Southern Baptists. After all, it’s not like they’re intrinsically disordered, just inordinately obstinate. LGBT Christians, let us love the sinner and hate the sin. Baptists too – “What should we do? Ross, Rick, and Al, where are you? Reflecting on his life not long before he died, Karl Barth wrote to his friends that he had only one serious regret: “my failures in real gratitude.” My own list will be a helluva lot longer, but already I can add “my negligence in paying attention”. The young find themselves fascinating; the old, frustrating. “Do not worry about tomorrow, for tomorrow will bring worries of its own. Today’s trouble is enough for today” (Matthew 6:34). Only someone who knows that he will shortly die could say such a thing.